Vaccinating badgers could prove a good way to tackle the spread of TB in cattle, according to research. In a four-year project, UK scientists found vaccination reduced the incidence of TB infection in wild badgers by 74%. This does not prove vaccinating badgers would reduce the number of cattle catching the disease, they caution. But they say it could "overcome some of the challenges" surrounding badger culling, which the UK government wants to bring in next year. "Badger culling as an approach to disease control can be costly, practically difficult and indiscriminate, and remains controversial," they write in the Royal Society's scientific journal Proceedings B. "Vaccinating badgers may be an alternative or complementary strategy that overcomes some of these challenges." However, there is general recognition that vaccination will become a much more feasible option once a version is available that badgers can eat - which will not be for four to five years at the earliest. The current research used an injectable vaccine that was licensed for use earlier in the year, based on the BCG inoculation given to humans. In Gloucestershire, scientists identified setts inhabited by groups of badgers. In some setts - randomly chosen - every badger received a dose of BCG. In the remaining social groups, none was vaccinated. More than 800 badgers were involved in total, and all were tested for tuberculosis infection annually, to see how the incidence of disease might differ between vaccinated and non-vaccinated animals. "We're really excited about the results, because we didn't design the trial to look at changes in the incidence but to look at the safety of giving animals BCG," said Robbie McDonald, head of the Wildlife and Emerging Diseases team at the Food and Environment Research Agency (Fera). "All of the safety aspects are fine, and that's why we now have this licensed vaccine - but the exciting thing was we had this strong effect of the vaccine on incidence, a 74% reduction," he told BBC News. Precisely how the vaccine achieved these effects in the wild is not entirely clear. Earlier laboratory-based studies showed it did not prevent badgers from becoming infected. However, it might do so in the wild, as the animals are probably exposed to a lower level of disease. Alternatively, it could slow the rate at which they become ill enough to be infectious, as was observed in the laboratory studies. This would mean each infected animal would be less likely to pass the disease to others. The acid test of vaccination would be to see whether it reduces the rate of infection in cattle. However, such a trial could take years to conduct and cost millions of pounds; nothing as comprehensive is being planned. In the meantime, the government intends to push ahead with plans to permit badger culling in England, assuming the results of its current consultation prove favourable. The Conservatives promised while in opposition to introduce badger culling if elected. "While vaccination will not be as effective as culling in quickly lowering the TB infection in the badger population, vaccination does have a part to play and our consultation covers how the two might be used together," said a spokesman for the Department for Environment, Food and Rural Affairs (Defra). 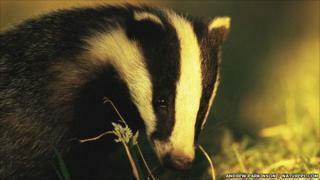 The Welsh Assembly Government also plans a cull in heavily infected areas. Chris Cheeseman - a badger ecologist and former head of the UK's Wildlife Disease Unit, who is also an author on the Proceedings B paper - said the government should look at its strategy again. "I think this is extremely encouraging and gives us ground for believing we're on the right track," he said. "But because Defra is committed to culling, they're focusing on that and I think they see the vaccination work as a distraction, even though it looks likely to prove a more sustainable long-term option. "They're being pushed by ministers like [Agriculture Minister] James Paice, who seems to be on a mission to cull; but what is their case for culling as a sustainable, effective and cost-effective option?" Meanwhile, the first season of a government-funded study looking at how vaccines could be deployed in practice has just concluded - also in Gloucestershire - with promising results. "In the first season, we've seen 541 badgers vaccinated on 93 premises over an area of 90 sq km," said Dr McDonald. "This isn't an evaluation of the vaccine's impact but to test the practicalities of vaccination - we ended up with more farmers wanting to join than we could cope with." In parallel, scientists are also working to develop an oral version of the vaccine, which entails giving the active ingredients a protective coating so they are not broken down by stomach acids.